How Do We Make Cheese? People often ask me, how do you make cheese? To my mind, cheese making is about timing, temperature and acidity. It is also 75% hygiene and 25% routine i.e. you follow the same make sheet so that the cheese does not vary much, save for changes in ambient temperature and milk season when you need to make tweaks. There is a mixture of skill, science and intuition involved in cheese making. First, you need a good supply of milk. We make goat, cow and sheep’s cheese. You can make cheese from buffalo, reindeer, yak to name but a few creatures. People who know of my love of pigs ask why don’t I make cheese from pig’s milk, my immediate answer would be – have you tried to milk a pig? But on a more serious note, I am told that as pigs are non ruminants, the fat in their milk comprises long chains which does not lend itself to making cheese compared to milk from ruminants such as cows, sheep and goats which are composed of short fatty chains. Ok, so you have your milk, preferably from a single herd that you know, so that you can be assured of good quality farming methods, including the type of feed, housing, water availability, mucking out regime, when and where they are turned out, if at all, and for how long. Happy animals produce a much better quality of milk. If you are making pasteurised cheese, it needs to be pasteurised to 72 degrees C for 15 seconds through a continuous flow pasteuriser, or you can batch pasteurise at a lower temperature for a longer period. Alternatively, you can make an unpasteurised cheese, but you must be very careful with your hygiene and test the cheese for unwanted pathogens such as listeria, E-Coli, Staph A etc. We have a very small and slightly antique continuous flow pasteuriser with a flow rate of around 1,000 litres (that’s a tonne!) in about 1hr 15 minutes. That is quite slow, but we are patient and we do not make huge quantities at a time. 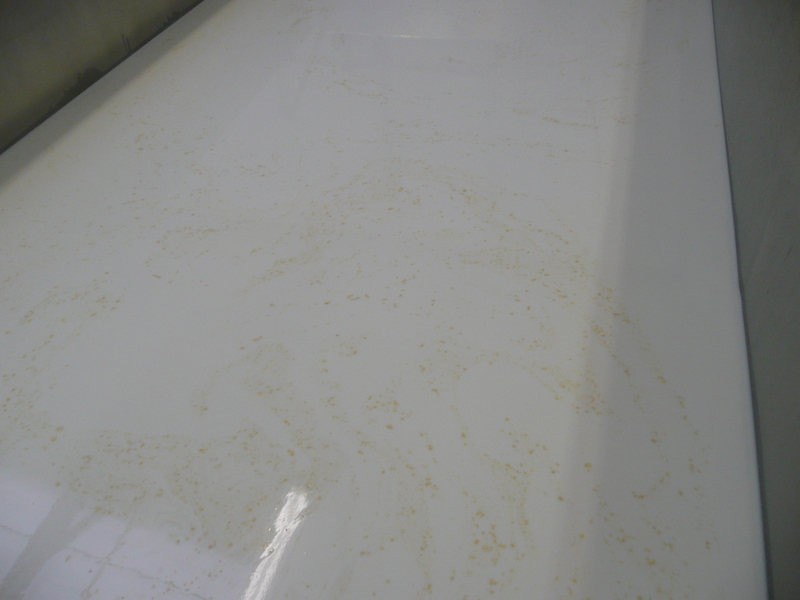 Large scale pasteurisers can process 15,000 litres an hour. You need to heat your milk to the desired temperature and add your starter culture to ‘ripen’. This can be a starter you have developed and incubated yourself or it can be out of a packet. There are pros and cons with both. Incubated starter culture makes a cheese less imitable and generally has its own flavour and texture characteristics, but if your starter goes wrong, you are in trouble. Packet starter culture is reliable and predictable but often lacks character and can of course be imitated. Danisco and Hansen are two starter culture manufacturers. The starter dictates the type of cheese you are making – it can be a wensleydale, a cheddar, a double gloucester etc. There is a starter culture that forms little carbon dioxide gas holes in the curd to give it that emmental type appearance. Starter culture converts lactose, the sugar found in milk into lactic acid and forms the scientific basis behind cheese making. Once you have ripened your milk – could be ten minutes, it could be an hour and ten minutes, to give it your special characteristics, you then rennet it. Rennet acts on the casein, the major protein compound found in milk to clot it: to form a coagulum. In my vat, this can take 35 minutes in the summer or upwards of an hour in the winter. Ambient temperature can make quite a difference. There are three types of rennet: animal, vegetarian rennet made from fermenting a type of fungus or plants and microbial rennet which is a chemically formed imitation of calf’s rennet (though vegetarian). 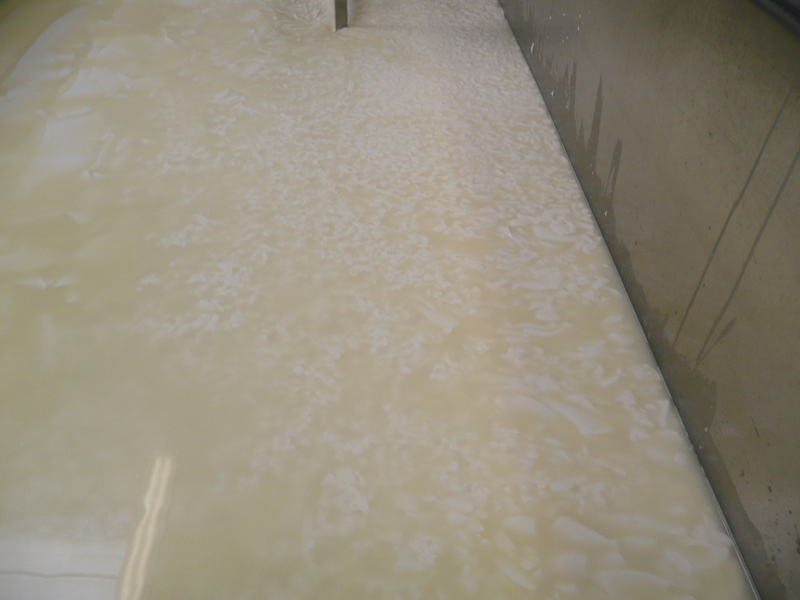 The aim of the rennet is on cutting, after the milk is set, to separate curds from whey. In home cheese making, people often use vinegar or lemon juice to achieve this ‘curdle’ and I would call this lactic cheese. To separate the curd from the whey, we need to cut the curd. You can do this manually with a long sharp knife or with a metal curd cutter. The smaller you cut the curd, for example, parmesan can be cut as small as a grain of rice, the harder the cheese will be as it will not contain as much whey inside as say a 1cm cube that you would cut to for a wensleydale type cheese. Immediately after cutting, the curd is very delicate so many people leave it to rest for a short time before stirring. 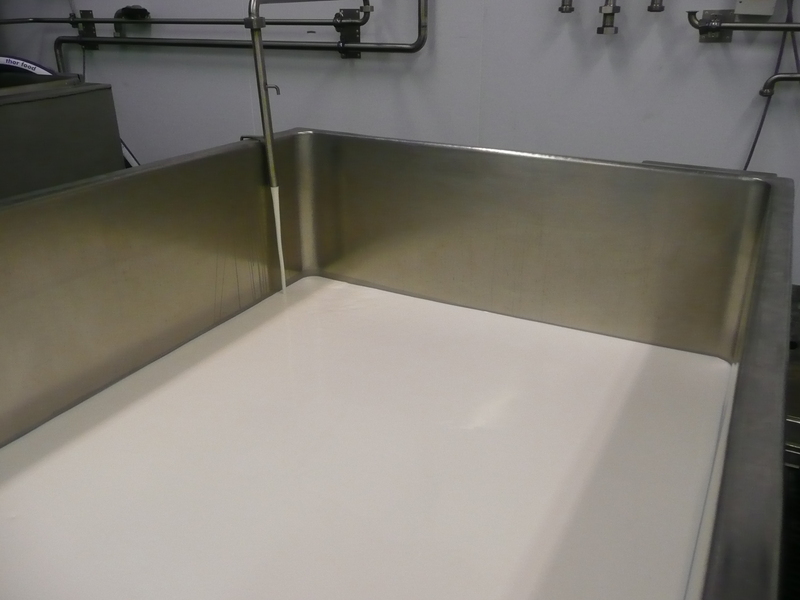 The curd sinks to the bottom of a vat as it is denser and heavier than whey. At this stage, you have separated curd from whey and in the case of cow and goat cheese, 90% will be whey and 10% curd. The idea behind scalding your milk is to raise the temperature is to expel more whey from the small pieces of curd. The higher the temperature of your scald, the firmer the cheese will be. A lower scald cheese results in a softer and moister cheese. A high scald can also affect both the colour and taste of the final cheese – this is a desired effect for some cheese makers. The heat is switched off or taken away. Some cheese makers move the cheese to the back of the vat and leave it until the acidity levels have reached a certain level. I don’t, I stir my curd because I do not want it to stick together as this makes an entirely different cheese for us. 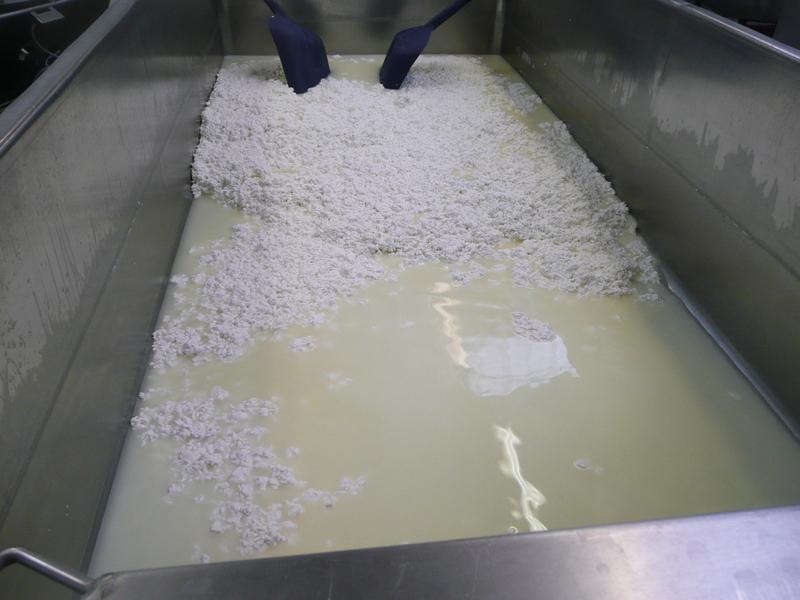 This is my favourite part of cheese making, I like to see the whey disappear and small mountains of curd emerge. Some people say that if you take the whey off too quickly, it can cause your cheese to taste a little bitter. I have never had that happen to me, but there is always a first time. 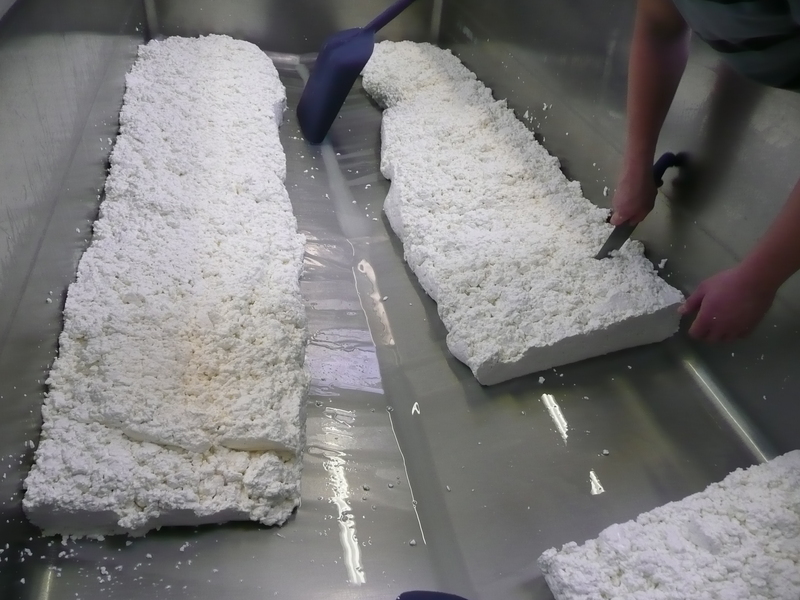 Once the whey has been taken off, most cheese makers shape the curd into blocks, cutting a channel in the middle to allow more whey to drain off. I turn the blocks until I have achieved my desired acidity, then I cut them into small squares and shovel them to dry them off and again expel more whey. Finally, when the curd has reached the right acidity level (I shall explain about acidity testing in another post), then I add salt and mill the curd which reduces it to fine crumbs. I then pot up the fine curd into moulds which are actually soup buckets using reusable cheese cloths and put it in the press. I set the press to around 40psi and tighten up when I go home, then the following day at the start, middle and end of the day so that it gets a gradual press. The cheese generally takes 2-3 days in the press when it is ready to come out, the cloths washed and the cheese vacpacked, labelled and put in to the cold room. Nice to see that you have a blog here. I just learned it from Kevin. Much fun with it. How about a trip to Munich again? Would be very nice to meet you again. Great post! It’s always interesting finding out how cheese is made, and the different routes that are taken to achieve various characteristics. Do you monitor pH throughout the process, or do you rely on timings? Thanks for your comment. Yes, I also find it fascinating that you can change the characteristics of a cheese by stirring less or more, cutting larger or smaller, scalding higher….other things too, so many variations, and I am still learning, believe me! Cheesemakers always document each make on a make sheet so that you can go back and see if anything different happened. To answer your question, I actually do not use a Ph meter, I could do, rather, I check the titratable acidity with an acidity meter through the process and particularly towards the end to salt at the right time. I will write a post about using an acidity meter once I have taken a picture of one. It’s a very simple operation, using 3 drops of phenolthalein as a tracer in 10ml of whey and slowly releasing sodium hydroxide until the solution turns pink. Some cheese makers say they can roughly tell the acidity by looking at the curd. I have to say, I can’t, but if both my acidity meters broke, (I keep a spare!) I would be able to estimate roughly by timings and temperature. I think with home cheese making, you can do it roughly by timings and temperature. I have posted a reply on the blog. Whilst some cheese makers do use a Ph meter, I use an aciditymeter and test throughout especially towards the end to know when to salt. You can do it on timings, but in warm weather, your vat can go a little faster, in cold weather, the opposite, and also if your milk is not as fresh as should be, this can speed up the acidity as there is more natural bacteria in the milk. Are you a cheese maker? With best wishes, and thanks for reading the blog – how did you come across it? And is it interesting enough? It’s been a massive learning curve so far. I’m currently just experimenting with various types of cheeses to expand my experience in as many areas as possible. I’ve been trying to get to grips with how acidity affects the make, as previously i’ve been working mainly off “feel”, timings and previous experience. My plan is to use this experience to try and focus on one cheese, making it over and over again to see if I can get repeatable results, at which point i’ll start varying the parameters (rennet point, curd cut time / size etc.) to see how they manifest themselves in the final cheese. Would be very interested to see your acidity measuring equipment, as well as when the critical points are! Thanks again for the great information – will be glued to your blog from now on!